Gold Reflective Fire Glass that has been tempered versus Blue Green Glass that has not been tempered. When shopping for something different, in this case fire glass like crystals for your fireplace or fire pit, you want to make sure you’re knowledgeable about the product. Since fire glass is relatively new to consumers several questions other than its colors have been brought up, and that’s extremely important. This article will explain the differences and give you some background on the definition of tempered glass versus annealed glass. One of the biggest reasons why consumers have gone in the direction of fire glass is because you have more options to choose from when it comes to color variations. The idea is to install something that’s modern and really grasp the attention of family and guests. Traditionally lava rocks or logs would have sufficed but options are extremely limited when you’re trying to go for a unique and beautiful look. Not only are you limited but when the time comes to clean your fireplace the idea itself of cleaning the mess is cumbersome. Therefore the use of fire glass has become the next popular home and hearth product. Customers now have the options of choosing a color that’ll match their color scheme to their pool for instance. Or, if their fireplace is indoors and would like to stick to their earth toned color schemes per say a color of Bronze Reflective Fire Glass might be the best solution. It all sounds perfect and creativity sets in when it comes to choosing your color of choice. However, be knowledgeable when doing your research online and don’t immediately go with the most inexpensive prices. Yes, the colors displayed online are rich and by all means will go perfectly inside a fire pit or fireplace. Glaz Chips Fire Glass strongly advises that you check the characteristics of the glass other than their color. Tumbling glass that has not been tempered appropriately will leave sharp edges. Tempered glass has already been formulated to withstand heat. However, glass that has not been tempered and is annealed will increase the risk of cracking and possibly popping due to the range of heat it is undergoing. Formulated tempering measures have been designed so that fire glass can withstand the heat of a standard fire place or fire pit. Glass breaks in a nice fracture pattern (see Gold Reflective Glass image above) and is tumbled to prevent shards or sharp edges making it suitable to handle. 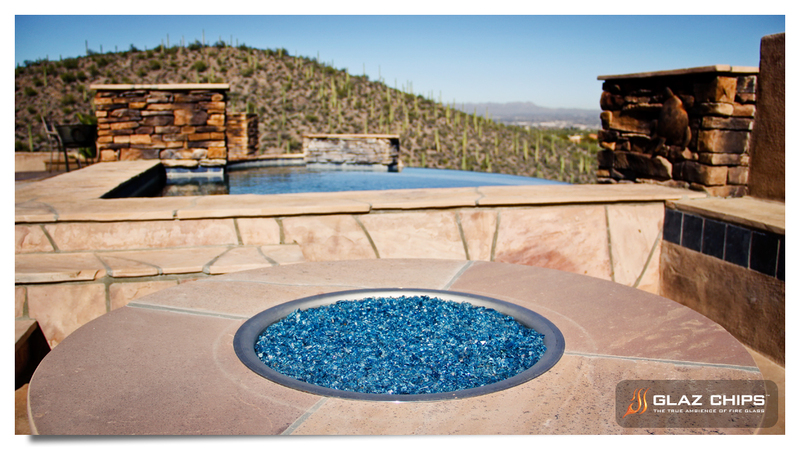 Tempered glass will not warp, melt or discolor throughout its period when installed in a fire pit or fireplace. Tempered glass will not pop during hot temperatures due to its tempering process that it has already undergone. Recommended for natural gas applications however can be used with propane gas. When using propane gas as your source, keep in mind that propane is a slightly dirtier form of gas in comparison to natural gas. It is advised to use darker Glaz Chips Fire Glass colors. Fire glass will not emit any gases or toxic fumes. In short, tempered glass is considered safety glass that will fracture in square pieces when broken and is therefore less likely to cause injury. Annealed glass, although inexpensive because it is not tempered, will more than likely crack when exposed to hot temperatures and will break off into large and sharp shards increasing the chance of injury. Now that you have those details in hand shop with ease knowing that our fire glass is not only manufactured in the United States but undergoes a tempering process which will result in a product that’ll last! Visit us today or request a sample at www.glazchipsfireglass.com. 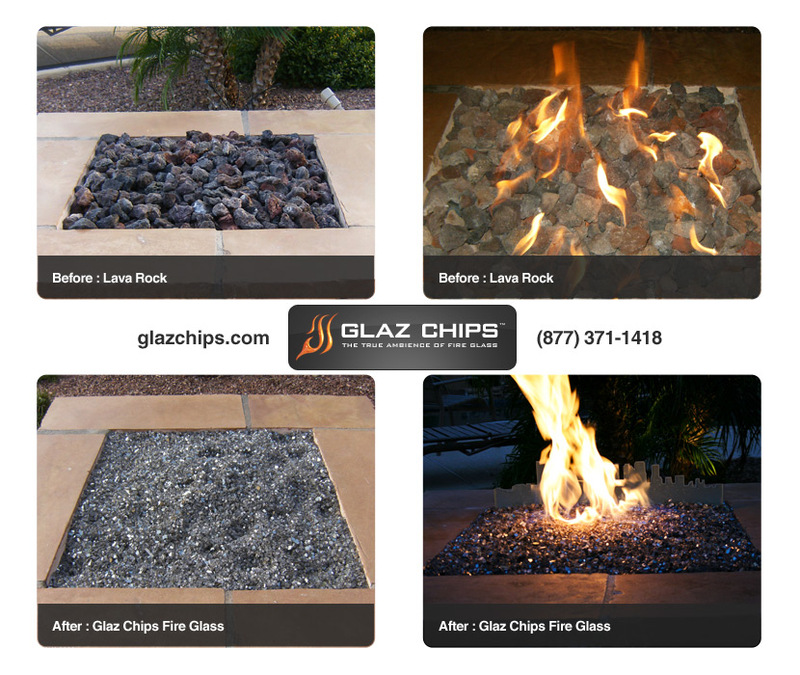 Glaz Chips Fire Glass is a product of Glaz-Tech Industries Manufactured Out of Tucson, Arizona. Gold Fireglass Premix : Azuria, Black, Bronze or Green. January 2013 has started off extremely well with this month’s sale of 1/4″ Gold Premixed Fire Glass. Since Glaz Chips Fire Glass came online, gold mixed fire glass crystals has easily been the most popular choice amongst home owners. With the idea of replacing an old contemporary system having lava rocks or dirty logs, fire glass has been the perfect substitute for decor either inside your fireplace or your outdoor fire pit. Originally at $5.75 /lb for gold reflective premixes, Glaz Chips has cut that price to $4.00 / lb plus an additional *10% off. Glaz Chips is all about savings, especially after the holidays. Love the idea of substituting glass crystals into your fireplace but not sure how much you need? Simply visit our online fire glass calculator and enter dimensions for either a standard indoor fireplace, square or round fire pit and see how much you’ll be needing. Enter SOCMED10 for 10% off at the moment of checking out and watch your savings add up!!! 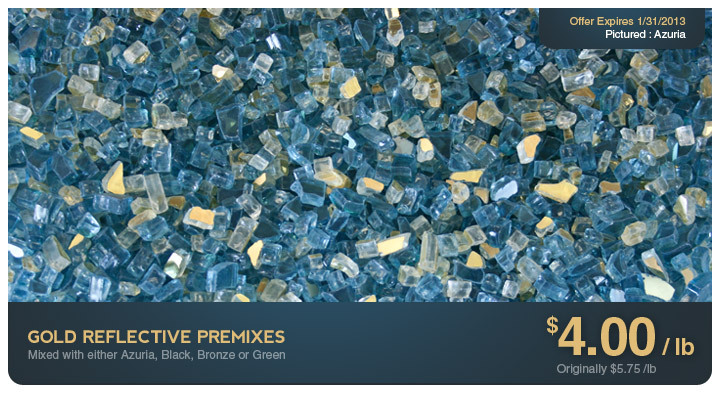 *Glaz Chips Gold Reflective Mix is offered with Azuria, Black, Bronze or Green and packaged in a 4:1 ratio. Glaz Chips packages its products in 10lb bags, 25 and/or 65 lb buckets. Due to transportation of the glass some minimal cleaning might be required at the time of using your product. **Glaz Chips Fire Glass is recommended to be used in conjunction with Natural Gas. If using propane gas as your source, it is advised that dark colors such as black, bronze or grey be used. Natural gas is a much pure and clean source of gas compared to propane which will eventually create a dark layer of debris. Minimal maintenance is required with Glaz Chips Fire Glass. A simple wash / rinse with water and drying time will suffice. No chemicals should be used to clean glass. As 2012 comes to a successful close, Glaz Chips Fire Glass will heavily promote bundles that not will include its various fireglass crystals, but will include stainless steel burners for indoor fireplaces and outdoor fire pits. Glaz Chips Fire Glass already maintains a low cost on its glass crystals and the same can be said about its new addition of stainless steel burner hardware. Feel free to compare glass and hardware prices, Glaz Chips is pretty confident in its product, quality and its low cost throughout the web! Customers have slowly been able to purchase these two items at an extremely low cost and rest assured that it will continue in 2013. Glaz Chips fireplace hardware is available in dual burner form. Usually the standard among burners, Glaz Chips dual fireplace burners are engineered and manufactured to give you the best and quality flame when lit. Stainless steel burners really showcase a balanced flame and output by strategically having drilled holes. This creates a beautiful even flame that practically dances on your fire glass crystals. The same can be said about the burners that are used outdoors in your fireplace or fire pit. These however are circular burners called o-rings. These too have been engineered to give you the best flame possible when lit. Depending the size that fits your fireplace, some of our stainless steel o-rings can have an addtional ring or two inside the outer ring for a more dramatic look to your fireplace. These stainless steel burners will definitely set the ambiance to your indoor fireplace or outdoor fire pit! So now you have either the stainless steel dual burner or o-ring in mind. How about the product? Several customers voice their opinions very directly. “Logs are extremely dirty and they make a mess around my fireplace”. “Lava rocks simply look dull and I want something that’s clean, less maintenance but will look attractive”. That’s where our product comes in. Plus with our prices, it’s no wonder a lot of customers preferred to buy a complete package with their stainless steel burners and fire glass together. 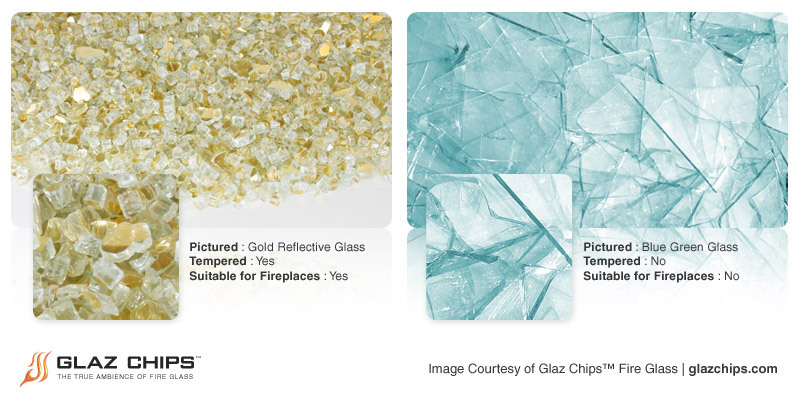 Glaz Chips has various colored glass, reflective glass and fire glass premixes to help you out in your decision making. So, without further a do visit our official online store at www.glazchipsfireglass.com and see what others have been raving about. 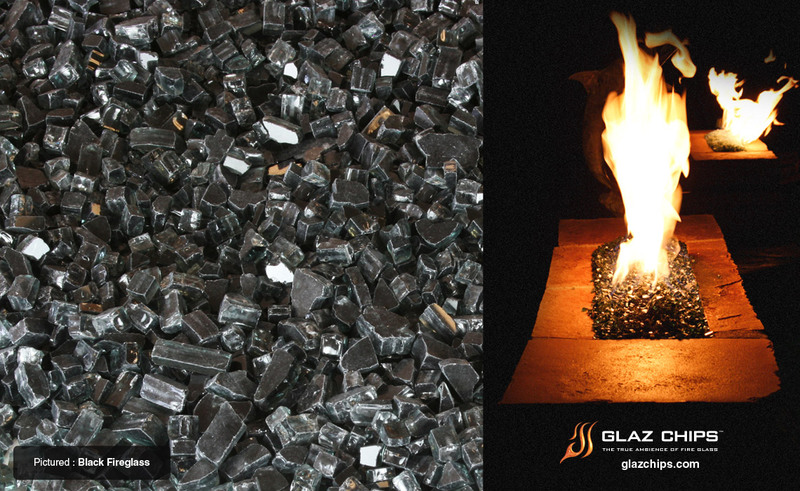 Glaz Chips Fire Glass … the solution for a beautiful and modern fireplace.